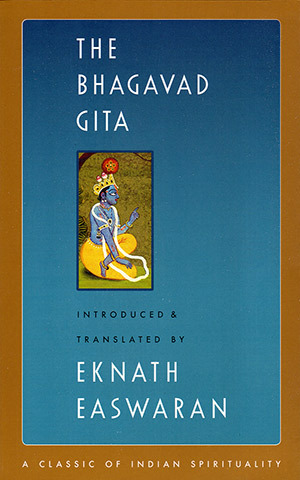 The best-known of all the Indian scriptures is the Bhagavad Gita or "Song of the Lord", and Eknath Easwaran's reliable, readable version has consistently been its best-selling translation. The author's introduction places the Gita in its historical setting, and brings out the universality and timelessness of its teachings. Clear explanations of key concepts are given in chapter introductions, and Sanskrit terms are explained in notes and in a glossary. The text opens dramatically on a battlefield, as the warrior Arjuna turns in anguish to his spiritual guide, Sri Krishna, for answers to the fundamental questions of life. However, as Easwaran points out, the Gita is not what it seems. It is not a dialogue between two mythical figures at the dawn of Indian history. "The battlefield is a perfect backdrop, but the Gita's subject is the war within, the struggle for self-mastery that every human being must wage" in order to live a life that is meaningful, fulfilling and worthwhile.